Student loan debt has become a crisis… 44 million American’s carry the burden of over 1.4 trillion dollars. You’re not alone in this fight, but you’re going to get out… quickly. But, here you are… making the decision to become debt free! Executing a personalized, well written plan will be your key to success. Quickly paying off your student loans takes patience, persistence and a well rounded financial tool box! Let’s build that tool kit now! Below we’re going to put together all of the tools you need to pay off those student loans quickly. Becoming debt free is a product of many choices, not a singular event. The tips below will help you build a financial tool box that’s going to help you crush your financial goals. After graduating from college you might not be expecting the student loan sledge hammer to drop as quickly as it does… but, it’s coming. Once you graduate, leave college, and drop below part-time status, your student loans enter a grace period. A grace period is just a moderately kind thing the bank does to let you get your life figured out before they smack you in the face with a hammer. Think of the grace period like a final count down before payment blast off occurs. Maybe its kindness, maybe they’re ensuring they get their money back… whatever it is, that first bill is coming soon after exiting school. The length of your grace period depends on the type of student loan you have: Private vs Federal. Look into this and make sure you understand when that first bill is coming. Once you know when to expect your first bill, you need to create a plan to have the necessary cash on hand to tackle your student loans. Having the ability to handle the pending payments is a product of the choices you make during the first 6 months after leaving school. You’ll build the foundation for your ability to quickly pay off your student loans during this time. After you lock down your first job, you’ll be tempted to go out and buy a lot of new toys, get a sweet new apartment, and keep up with the Joneses. Abort! Abort! These choices will sabotage your ability to quickly pay off your student loans. Create a solid foundation in these first few months and plan to embark on a fabulous life of frugality, but only for a little while. This choice may appear outlandish to those who are drowning in debt, but you’re not trying to impress those people. You’re trying to become debt free. Don’t go out and buy a new car, don’t look for a flashy new apartment, and most importantly… don’t try to keep up with the Joneses. Keep your old car, get a roommate… or move back in with your parents (I know, I know…yuck), and plan to live frugally when others are blowing those delicious new salaries on useless liabilities. Being able to live far below your perceived “means” will provide the fuel needed to quickly pay off your student loans. It’s not often that you’re allowed to start a race before the starting gun is fired, but when it comes to student loan debt… Go, baby… Go! Starting payments early may also be a massive benefit if your loans are accruing interest while you’re in school. If you have Federal Unsubsidized, Federal PLUS, or private student loans (potentially), you’re accruing interest while you’re in school!! Keeping up with the accruing interest would be a great goal while you’re in school. You may be able to prevent interest capitalization and this has the potential to save you thousands of dollars! In a perfect world, you’ll be able to pay off some principal balance while in school. You can make this happen by taking on a job while going to school. It’s not fun, but it’s possible. I know this is possible because I worked at a small hardware store while battling through nursing school. It seriously impacted my free time, but it kept me from accruing additional debt. Looking back, it was worth it… even if I felt like I was missing out on some social activities back then. I wish I could go back in time and smack my 22 year old self in the face with a “how to budget” book. It would have made paying off my student loans so much easier. Don’t let the thought of creating your first budget intimidate you. ⇐ Read this post and start simple! Income – Expenses = Remaining cash. Remaining cash will go towards your student loans. Creating a budget will serve a number of purposes. It will help you understand your new expenses, when they’re due, track your spending habits, and hold you accountable for your spending. You’ll not only need to write down what you owe each month, you’ll also need to write down what you spend every day. Every. Single. Day. You’ll be constantly monitoring your budget to ensure you’re not over-spending. I would highly suggest you don’t follow a standard budget plan. These cookie cutter plans aren’t built for everyone’s unique life. They’re a great starting point, but if you fine tune your budget, you’ll find success quickly. No matter how you budget, one thing remains true… Budgeting is one of the main ingredients in your ability to quickly pay off your student loans. You absolutely need a well written and tracked budget. Standard repayment plans will have you paying on your student loans for 10 years. Graduated repayment plans are created for folks who expect to make more money as the years go on. These plans can be extended out to 30 years if you consolidate your loans. The minimum payments will increase every two years and you’re going to pay a lot more interest than the standard repayment plan. Income driven repayment plans are based around your salary and family size. These plans can last as long as 25 years and your payments will adjust to your income and family size. Again, you’re going to pay a lot of interest compared to the standard 10 year plan. The point of these plans is to show you that if you make only the minimum payments, the shortest period of time (other than some private loans) it’ll take you to become debt free is 10 years. 10 years!! You must make more than the minimum payment and ensure that extra payment is applied to the principle balance, not interest. By making more than the minimum payment, you’re going to save time and thousands of dollars in interest. There are a number of popular debt repayment options available to you when paying off your student loan debt. The two most popular methods are the debt snowball and debt avalanche. These two options are really only applicable if you have multiple loans. If you only have one loan, just skip right over this part. The debt snowball is an extremely popular method. It’s built on a foundation of simplicity and emotional wins. The debt avalanche is lesser known, but it’s built on a foundation of money saving principles. So, which repayment method is right for you? Well, let’s look at each one a bit further and you can decide for yourself. The debt snowball. The rock star of the debt repayment world. If you’re not familiar with the debt snowball, it’s pretty simple to explain. It’s really that easy. It’s all balance related. Interest rates are irrelevant here… As you pay off each student loan, you’ll just keep rolling those payments into the next student loan until those babies are gone! By the time you reach your last student loan (largest balance), you should be packing quite the payment punch each month and you’ll be able to pay it off quickly. The debt snowball is all about emotional wins. You’ll get satisfaction early as you pay off your first (smallest) student loan. By the time you get to those nasty big balances, you should have developed some thick financial skin and will be ready to settle in for the last and longest fight. The debt avalanche isn’t often referenced by those who are following the Baby Steps. I feel bad for the avalanche… It’s not that it’s ineffective. It’s poorly marketed. 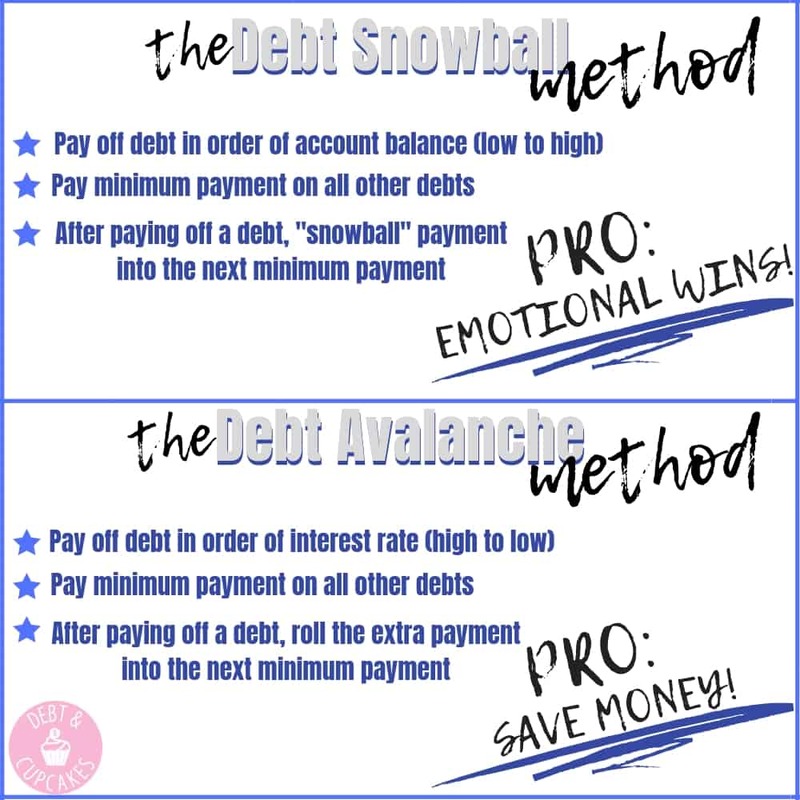 The debt avalanche is similar to the snowball but instead of listing your student loans out in order of balance, you’ll list them out in order of interest rate (highest to lowest). You’ll follow the same steps as the snowball, but this time you’re going to start paying off your student loans in order of interest rate. Starting at the highest and working backwards to the lowest. The avalanche is about money wins, not emotional wins. It could save your thousands of dollars in interest if you’re largest debt also carries the highest interest rate. The biggest problem with the avalanche is that most folks aren’t mentally prepared to attack their largest student loan first. The tedious nature that accompanies the debt free journey can scare a lot of people away. If you’re able to stick it out, the avalanche might save you a boat load of cash… The potential savings makes the debt avalanche worth considering. What About A Hybrid Payment Plan? Maybe there is a best of both worlds? What if a snowball causes the avalanche? What I mean is, what if we start with the debt snowball and then merge into the debt avalanche? Let’s create two student loan lists. First, list out your loans in order of balance (least to greatest) and then list them out again in order of interest rate (highest to lowest). Pay off the student loan with the lowest balance, get that awesome emotional win… and THEN jump into the avalanche. Whichever loans are remaining are going to be listed out in order of interest rate (highest to lowest) and you’re going to attack that high interest rate. Had I known about the debt avalanche, I would have most likely used this method when we were navigating the Baby Steps. By getting away from standardized processes, you’re going to set yourself up for both emotional and financial victories. Save money and your sanity!! Some student loan providers offer a 0.25% interest rate reduction if you sign up for their auto-pay service. Auto-pay means that you’ll enter your bank account information and sign up for your bill to be automatically paid. You will NOT have to log in and process the payment. It will automatically be drawn from your account on a specific date. Auto-pay is a great security blanket for a loan provider because they know the money is coming in each month, and for this reassurance, most will offer you a reduced interest rate! Win-win. Auto-pay does not prevent you from making extra payments, but it will help lower that nasty interest rate, and that can help save you money in the end. Use this as a tool to help save money. Do not use it as a rationale as to why your minimum payments aren’t as bad anymore. Another amazing tool for expediting student loan payments is getting another job or starting a side hustle. This extra job may be related to your degree, or something totally different. In 2019, there are so many options to make money online that there isn’t much of an excuse to not create a side hustle if you’re looking for extra money. Taking on a 2nd job isn’t always fun, but getting out from under your student loans is a hell of a good time! I vividly recall working per diem in an out-patient surgical center’s PACU to earn extra income. I’d go weeks without a day off, but I needed the extra money and the job wasn’t really THAT stressful compared to my usual ICU gig. I did it for as long as I needed to, and when I didn’t absolutely need the money, I stopped. Working weeks on end without a break is mentally exhausting, but knowing you’re only doing this for a short period of time will help get your through. Make extra money and throw it all at your student loan debt. ALL OF IT! If you’re carrying some high balance, high interest rate loans, it may make a lot of financial sense to consolidate and refinance your student loans into a singular loan with a lower interest rate and better terms. Student loan refinancing can be summed up like this. You’re taking your current student loan obligation and replacing it with a different loan obligation. Your initial loan will be paid off with the balance of the new loan. The difference between the two loans is found in the terms (length, interest rate, type of loan). Refinancing gives you the ability to lower your interest rate and term length. Doing this can save you money and years of payments. Should you… and can you refinance your student loans? Perhaps, yes… Perhaps, no. Here are some things to consider before refinancing your student loans. One of the first items to consider is your credit score. If you’re going to try and get a loan from a private lender to refinance your student loan debt, they’re going to want to see a good credit score before they dish out some cash to you. If you’ve never checked your credit score, you can check it easily on Credit Karma. It’s free and it doesn’t impact your credit score to check. If you’ve got a good credit history, you might be eligible for the lowest rate and best terms available. Lenders get all googly eyed over your debt-to-income ratio. This is a very basic measurement of your ability to take on and pay for new debt. Your ratio is your total monthly income compared to your total monthly debt. For example: If you have a total monthly income of $5,000 and a total monthly debt obligation of $2,000… your debt-to-income ratio is 40%. There isn’t a maximum debt-to-income ratio, but lenders don’t typically like to see a ratio greater than 38%. The lower your debt-to-income ratio, the better your rate will be. Current interest rates vary greatly. If you were fortunate enough to secure a low interest rate loan, it might not make a ton of sense to go through the effort to refinance your loans. If you feel your current rate and/or terms are negatively impacting your life, or costing you money, then by all means seek out a private lender to refinance with. One of the best calculators I’ve found online is the Make Lemonade Student Loan Refinancing Calculator. You can use this tool to compare your current loan with a potential refinanced loan. The decision as to whether you should refinance or not will be clear. Easy peasy. Bonus tip: You don’t have to put all of your eggs into one basket. There isn’t a restriction to how many lenders you apply to. If you apply to multiple lenders within 30 days, it’s usually treated as one inquiry and your credit history shouldn’t be peppered with hard checks. Before you apply, ensure the credit checks won’t stack up… You certainly don’t want to lower your credit score in the name of refinancing. I would consider this a last ditch effort to better your financial life. If you don’t believe you’re going to be approved, or have already been rejected for refinancing, you can bring a qualified co-signer with you to secure a loan with better terms. Consider this, you’re putting your student loan burden on the shoulders of someone else. If you can’t make the payments for this new loan, the bank will go after your co-signer. Make sure they understand what they’re taking on, and they should assume that they’ll have to pay the balance off. If they’re not comfortable with this responsibility, they should NOT be your co-signer. Even if you feel confident you’ll be able to cover the loan entirely, stuff happens… and you might not be able to. This is a massive burden and responsibility for your co-signer. Have this hard conversation before you get to the bank. We’ve covered a lot of ground today. Quickly paying off your student loans is a phenomenal idea. You’re going to position yourself for incredible success by removing this financial cancer from your life. As you’ve read, there are a number of ways to quickly pay your loans. The avenue and methods you employ are personal choices. You should choose a path to debt freedom that fits well into your life. Sustainability is the key to success. It doesn’t matter how great a plan is if you quit and never make it across the finish line. Create a plan with the tools provided and attack your student loans with passion and dedication. Imagine your life without student loans, use this as fuel to keep you motivated during what could be a long journey! 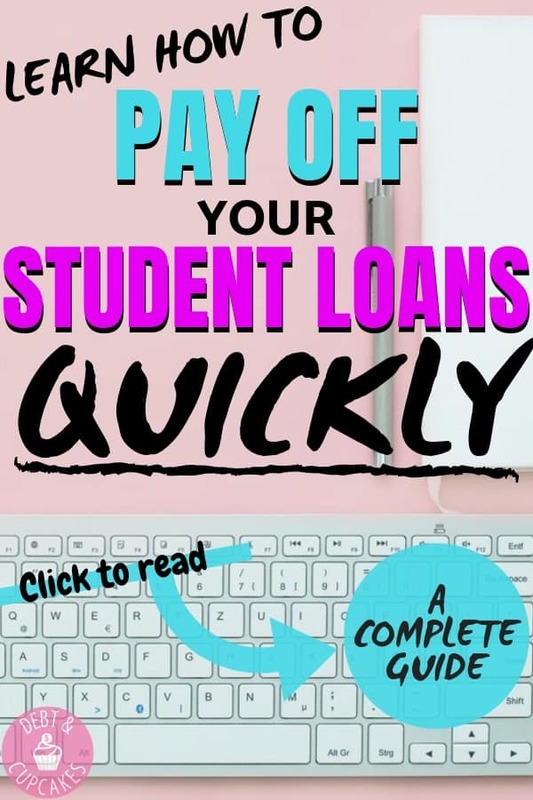 Now that you know how to pay off your student loans quickly, help someone younger than you learn how to avoid being buried in student loan debt! Don’t forget to subscribe below and receive new posts and free printables! !